LB333, introduced by Ralston Sen. Merv Riepe as part of the governor’s budget modification package, originally would have eliminated the state’s short-term disability program. Those provisions were amended out on general file. Instead, the bill includes provisions of LB495, introduced by Riepe, which clarify funding priorities for individuals with developmental disabilities who are eligible for services through the state Department of Health and Human Services (DHHS) Medicaid and community-based services waiver. The bill updates definitions for developmental and intellectual disabilities and pauses for two years a state entitlement program for high school graduates with developmental disabilities. Also included are provisions of Riepe’s LB417, which require DHHS to develop and implement a quality management and improvement plan for services to individuals with developmental disabilities. The provisions also sunset the existing Quality Review Teams and add representatives to the state Advisory Committee on Developmental Disabilities. LB333 passed on a vote of 48-0. Also introduced by Riepe as part of the governor’s budget modification package was a bill, passed 42-0, that delays rate changes for child care subsidy providers. The Child Care and Development Fund Market Rate Survey is required by the federal government. Current state law requires DHHS to adjust the rates paid to child care subsidy providers every other year based on the survey. LB335 eliminates implementation of any rate changes in 2017. For the next two fiscal years the provider rate cannot fall below the 50th percentile, or the rate for the immediately preceding fiscal year. Currently, the rate that child care subsidy providers receive must be between 60 and 75 percent of the market rate. The rate for the fiscal year beginning July 1, 2018, must be at least the 60th percentile of the last three quarters of the prior fiscal year or the rate for the fiscal year beginning on July 1, 2016. Senators passed a bill that allows public and nonprofit ground emergency medical transporters to be reimbursed by Medicaid at an enhanced rate. LB578, introduced by Omaha Sen. Mike McDonnell, establishes a Ground Emergency Transport Program in Nebraska to allow eligible providers to receive supplemental Medicaid reimbursement for ground emergency medical transport services, if a state plan amendment is approved by the Centers for Medicare and Medicaid Services. The bill requires DHHS to design and implement an intergovernmental transfer program relating to Medicaid managed care to increase capitation payments in order to increase reimbursement to eligible providers. The program applies to providers owned or operated by the state or a city, county, rural or suburban fire district, hospital district, federally recognized Indian tribe or other unit of government. Participation by local government entities is voluntary. DHHS is required to submit a state plan amendment by Jan. 1, 2018, to provide for a supplemental reimbursement rate and to submit necessary materials to the federal government annually. LB605, introduced by Riepe, allows the DHHS Division of Medicaid and Long-Term Care the flexibility to modify provider rates as needed to comply with federal regulations. The bill revises provisions of the Intermediate Care Facilities for Persons with Developmental Disabilities Reimbursement Protection Fund by allowing Nebraska to fully maximize federal matching funds available for the state’s provider tax. LB605 passed on a 47-0 vote. A proposed eligibility change in the Supplemental Nutritional Assistance Program (SNAP), formerly known as food stamps, failed to advance from general file this session. LB358, sponsored by Omaha Sen. John McCollister, would increase the SNAP gross income eligibility limit from 130 to 158 percent of the federal poverty limit. The bill failed to advance to select file on a vote of 24-19, one vote short of the number required. Lawmakers considered several proposals this session intended to reduce barriers to employment by changing licensure regulations for various health-related occupations. Introduced by Bellevue Sen. Carol Blood, LB88 allows military spouses to obtain temporary licensure in Nebraska in a variety of health professions under the Uniform Credentialing Act. • LB342, introduced by Bayard Sen. Steve Erdman, which amends portions of the state’s Nurse Practice Act to allow Nebraska to join the Enhanced Nurse Licensure Compact when it takes effect — either on Dec. 31, 2018, or when 26 states have joined. The bill removes a requirement that nurses educated in a foreign country pass a specific examination or hold a certificate from the Commission on Graduates of Foreign Nursing Schools. Instead, an applicant will be required to pass a board-approved examination and provide satisfactory evaluation from a board-approved foreign credentials evaluation service. It also removes a requirement that a licensed audiologist obtain a second, specialist license in order to sell hearing instruments. LB88 passed on a 49-0 vote and takes effect immediately. Nebraska dental assistants have the option of becoming licensed under a bill passed this session. Introduced by Kolterman, LB18 creates a new category of licensed dental assistant. Licensure is optional under the bill. The bill also creates the position of expanded function dental assistant and provides the option for credentialing in expanded duties for licensed dental assistants, dental hygienists and public health hygienists. The bill passed on a 46-0 vote and becomes operative Jan. 1, 2018. LB19, also introduced by Kolterman, removes a requirement that an individual receive a letter of referral from a medical practitioner before seeking services from a licensed acupuncturist. Instead, a licensed acupuncturist is required to refer a patient to an appropriate practitioner if his or her symptoms are beyond the training, experience or competence of the acupuncturist. LB19 passed on a 46-0 vote. Senators approved several measures related to prescription drug monitoring and regulation this session. Pharmacists are allowed to substitute biological products with FDA-approved interchangeable biologics under a bill passed this session. Biologics include viruses, therapeutic serums, toxins, antitoxins, vaccines, blood components and allergenic products used to treat or cure human diseases. An FDA-approved interchangeable biological product is one that the FDA has determined to be therapeutically equivalent to a prescribed product. Under LB481, introduced by Kuehn, a pharmacist who receives a prescription for a biological product and chooses to dispense an interchangeable biological for the prescribed product must advise the patient or the patient’s caregiver that drug product selection has occurred. The bill also requires DHHS to maintain a link on its website to the current list of all biological products that the FDA has determined to be interchangeable biological products. LB481 passed on a 47-0 vote. State law regulating pharmacy practice in Nebraska was updated this session. LB166, introduced by Seward Sen. Mark Kolterman, amends and updates the Pharmacy Practice Act and the Uniform Controlled Substances Act. • requires that a registered pharmacy in which controlled substances are stored or dispensed complete a controlled-substances inventory when there is a change in the pharmacist in charge. The bill also clarifies that a Schedule II controlled substance may be dispensed in an emergency situation in which a prescribing practitioner determines that no appropriate alternative treatment is available, immediate administration of the controlled substance is necessary and it is not possible to provide a signed prescription for the dispenser. LB166 passed on a 49-0 vote and takes effect immediately. Lawmakers made several changes to the state’s child welfare system with the passage of LB225, sponsored by Bellevue Sen. Sue Crawford. The bill extends an alternative response pilot program and authorizes its use statewide. Alternative response allows DHHS to provide services to families that meet certain screening requirements and are the subject of a child abuse or neglect investigation where the risk to the child is considered minimal. The bill expands Nebraska’s alternative response pilot to a statewide program and extends the authorized use of alternative response until Dec. 31, 2020. 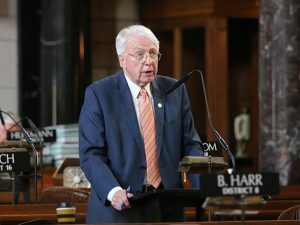 The bill also requires that the mandatory evaluation of the program be presented to the Nebraska Children’s Commission by Nov. 15, 2018. • LB336, sponsored by Ralston Sen. Merv Riepe, allows DHHS to charge a maximum $3 fee to conduct a central registry check. LB91, sponsored by Omaha Sen. Robert Hilkemann and passed 48-0, updates the definition of inherited or congenital infant or childhood-onset diseases and defines pharmaceutically manufactured foods as those that are chemically synthesized or processed for the treatment of inborn errors in metabolism. The bill also raises the maximum fee that can be charged by DHHS to administer the newborn screening program. The fee, currently capped at $10, may be raised to $20 under the bill. LB323, sponsored by Seward Sen. Mark Kolterman, establishes the Palliative Care and Quality of Life Act and creates an advisory council that will meet at least twice a year. The bill requires DHHS to establish the Palliative Care Consumer and Professional Information and Education Program. Information will be made available on the department’s website on or before June 30, 2018. Under the bill, DHHS is required to provide an information support sheet of available programs and services, which also will be posted on the department website. Lawmakers also passed a bill that prohibits insurance providers from excluding coverage for a service based solely on its deliverance through telehealth. LB92, sponsored by Kolterman, requires health insurance companies to cover any service provided via telehealth if the service is covered for an in-person consultation. The bill also removes an existing Medicaid coverage restriction for children if a child has access to services within 30 miles of his or her place of residence. The bill does not apply to policies that provide coverage for a specified disease or other limited-benefit coverage. LB92 passed 49-0. LB195, sponsored by Omaha Sen. Joni Craighead, requires all health care facilities that perform mammography to include in the mammography report the patient’s individual breast tissue classification based on the Breast Imaging Reporting and Data System established by the American College of Radiology. A requirement for offering onsite flu shots in Nebraska also was expanded this session. Current law requires all hospitals, intermediate care facilities and nursing and skilled nursing facilities to offer onsite influenza and pneumococcal disease vaccinations to residents and inpatients prior to discharge.